If you have a high speed internet connection (cable, DSL or better) and the QuickTime™ Player, you may view an instructional video on the use of Airbrush Liposculpture® System and see its bloodless fat removal in real time through a skin window. The fat is removed both above and below Scarpa's fascia while the vascular lattice is totally preserved without injury. Alternatively, you may download the movie (18Mb) in a format (.wmv) to view with the Windows® Media Player. 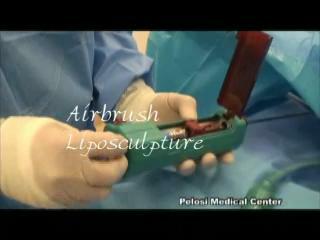 The AirbrushTM Liposculptor is ergonomically designed to facilitate one-handed, continuous adjustment of stroke length for power assisted liposculpture. Space age technology using advanced composite materials, pneumatics, electronics, and motion control allows responsively controlled power to be packed into a minimum of space and weight. Patented mechanically efficient and gentle twin-cannula liposuction allows the surgeon to effortlessly adjust the stroke length of the instrument to achieve the desired artistic result as he sculpts the desired body contours. It unleashes the artist in the surgeon, permits the patient to visualize his or her results sooner and speeds return to active life. Advanced digital signal processing, integrated circuitry, and proprietary software allows intelligent and responsive functioning with the surgeon able to continuously vary stroke length with his operating hand. Panel displays tell the surgeon precisely what the stroke length and rates are as well as graphically depicting both parameters, cannula position, and operating status at all times. Solid state circuitry and advanced programming allows the feel and functioning of each instrument to be customized to the surgeon's preferences. High quality permanent cannula pairs are available in a wide variety of lengths and sizes. The reusable multicore connector allows rapid and convenient single button connection and disconnection of control, power, and gas. An single cannula electrical, power assisted small-footprint liposuction device facilitating small and medium volume fat removal, easy sculpting, and fat harvesting. A separate RadioSurgery Module is specially designed for use with the Intellimotion® Controller which supplies optimal synchronization of hemostatic power with cannula motion. Power is only applied to tissue within the cannula, i.e. any small blood vessels in the stalk of the aspirated fat globule that would otherwise have simply been avulsed and left to bleed. The ultrahigh frequency of 1.7 MHz output serves to further minimize lateral heat production. The effect is minimal bruising, rapid healing and excellent cosmetic result. 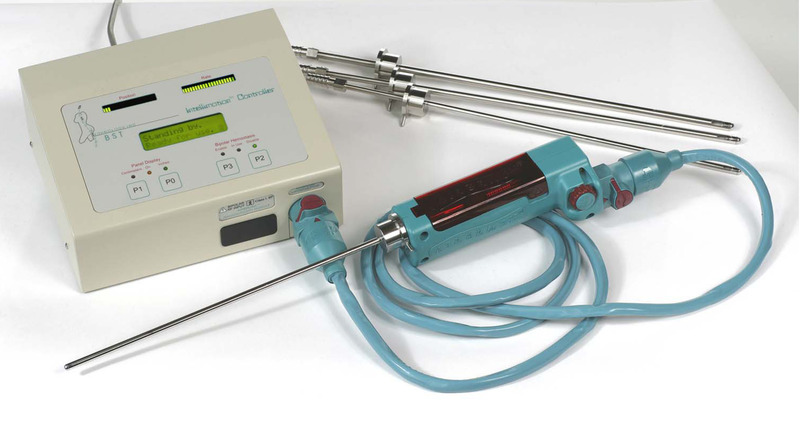 The versatile unit may also be used as an independent electrocautery unit with both unipolar and bipolar capabilities. Hand pieces and foot pedals are available for it. It has an easily adjustable power range to "dial-in" the exact level suitable for any given procedure, an indicator of current being supplied, and automatic fault checking. A low noise, compact compressor to provide a self-contained compatible and filtered air source for the surgeon desirous of avoiding the necessity and expense of tanked gas in the office setting. Greatly lessens the mechanical exertion required by the surgeon. Facilitates resection in fibrous areas such as gynecomastia and the flanks. Ease of feathering at the margins of tissue resection. More precise and even tissue removal with reduced postoperative lumpiness. Safer, cheaper, and faster than ultrasonic devices. Less tissue trauma and bruising. Pneumatic Airbrush Liposculpture® Systems are not longer available for purchase as production is being retooled to the next generation of Twin Cannula Assistled Liposuction ("TCAL") technology, a sleeker line of electromagnetically activated hand pieces.